Create a sign-in flow for users and use profile information to provide users with personalized functionality using Firebase Authentication. Complete the tasks in Before you begin in Setting Up Your Project and Application. In this example, you add code to the gophers-4 sample, which is the final product from Storing Data. 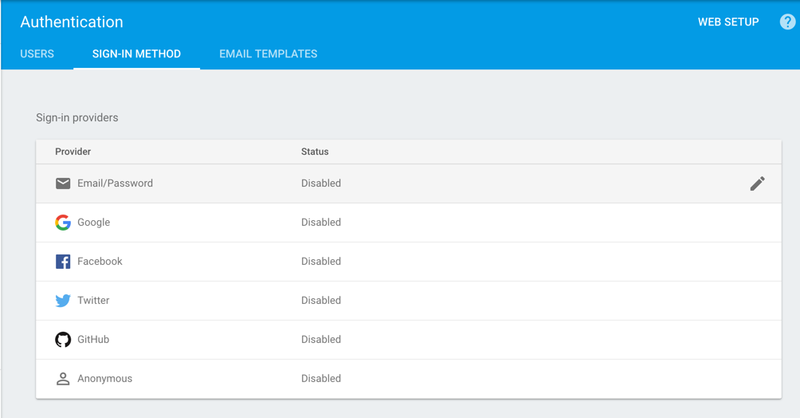 Complete Add Firebase to your app including adding the initialization snippet to index.html. Enable the providers you would like to offer to your users for authentication in the Firebase console by clicking Authentication > Sign-in method. Then, under Sign-in providers, hover the cursor over a provider and click the pencil icon. Toggle the Enable button and, for third-party identity providers, enter the provider ID and secret from the provider's developer site. The Firebase docs give specific instructions in the "Before you begin" sections of the Facebook, Twitter, GitHub guides. After enabling a provider, click Save. Do not include http:// before the domain name. The Config type represents the configuration used to initialize a new Firebase application. Add another <div> tag in the body of index.html to show the user's account information and a Sign Out button which will be hidden unless a user is signed in. User clicks to sign-in to specific provider. The index.js code sends a request to Firebase to log in. Firebase sends back user information and ID token, updating the entries in the form and the web page to display current signed-in user. User then creates a message and submits the post to your application, which gets sent to the App Engine server. Server pulls the ID token from the form and sends to Firebase to receive the user information associated with the ID token. Firebase brings back the user information back to the App Engine server, which stores the post with the user information in Cloud Datastore. Create index.js in the static folder of your project. Add a handler to your Sign Out button that calls the Firebase signOut function. When the user successfully signs in, Firebase creates a corresponding ID token that uniquely identifies the user. The getIdToken function retrieves the ID token from the client and attaches it the HTML form. Before the client can access server data, your server must verify the token is signed by Firebase. Each sign-in identity provider sends a different set of claims, but each has at least a sub claim with a unique user ID and a claim that provides some profile information, such as name or email, that you can use to personalize the user experience on your app. 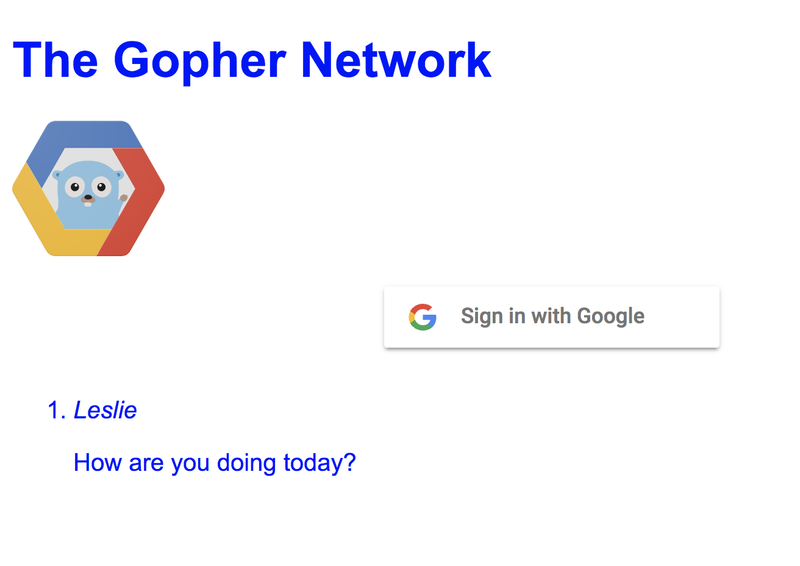 Try it now: Leave the local development server running and then try editing index.html to change "The Gopher Network" to something else. To avoid incurring charges to your Google Cloud Platform account for the resources used in this tutorial, complete the steps to delete your App Engine project. To do work in the background asynchronously after your request, use Task Queues.